Exactly two mineral deposits with Class 7 tectonics?! Hell, yeah, Planet IV! This was a fun session. My first priority was to upgrade my ship, so I decided to start close to home and mine the rest of the planets in the Sol system. This led to a couple of interesting lessons and encounters. 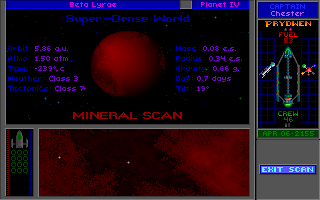 When you approach a planet and scan it, the game gives you some important variables. The ones that matter most (at least, right now) are gravity, weather, and tectonics. Gravity determines how much fuel it will take for your rover to land and blast off. 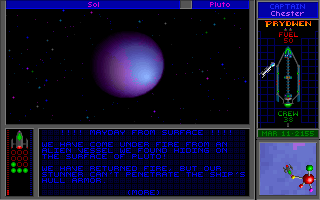 (And, unlike Starflight, the game won’t let you try to land on gas giants.) Weather and tectonics determine how dangerous it will be for your rover while on the surface. Planets with high weather ratings often having lightning bolts scouring the planet’s surface and anything in its path. Planets with high tectonic activity will have a lot of earthquakes. These perils do not damage the landing vehicle precisely. But they do kill crewmembers, who in this game are a kind of measure of hit points for their associated vehicles. I’ve found that if the class of either weather or tectonics is greater than about 3, I won’t be able to effectively dodge the associated hazards, and I’ll probably lose a lot of crew. But even on comparatively mild planets, I can’t dodge storms and earthquakes 100% of the time, and invariably someone dies here or there. My two major expeditions this session both returned with about a dozen fewer crewmembers (out of 50). Lightning destroys my lander as I stop for a screenshot. Landing on Venus was a bad idea, therefore. My landing vehicle was destroyed in seconds, and I decided to reload (I only have two). Mars was more stable. Jupiter, Saturn, and Neptune you can’t land on, but you can land on some of their moons. This is true of gas giants in most systems. 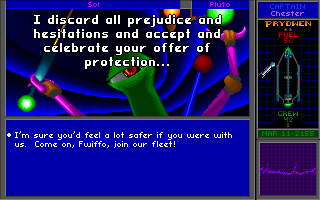 The planets and moons had a modest amount of resources, but I ran into an interesting encounter on Pluto. After you check out the metrics, what you want to do is scan the planet for minerals, energy, and biological signatures. Energy scans show structures and cities, while biological scans show roaming life forms. Pluto had only one mineral deposit but also had an energy signature. I sent the rover to investigate and soon found a weird multi-colored blob. As I trucked up to it, the crew of the lander sent a mayday to the ship indicating that the blob had fired upon them. “They killed Kowalski, Fritz, Chin, O’Donnell, Luigi, and all three of the Libermann triplets!” the officer in charge reported, as if my crewmembers are discrete individuals and not just interchangeable hit points. The crew is decimated by a weird alien spacecraft. The rover returned to the ship and the alien vessel made radio contact. I found myself talking with a creature that called itself a “Spathi” and named itself “Captain Fwiffo.” He begged my forgiveness and immediately gave me the coordinates to his homeworld. Since he was afraid already despite his superior technology, I adopted a haughty-but-not-hostile approach. Fwiffo related what I already knew about the history of the system–that humans had chosen to live under a force field on Earth rather than serve as Ur-Quan battle thralls. After that, the Ur-Quan chose some Ilwrath and Spathi ships to station themselves on the moon and make sure Earth kept its promise. The Ilwrath later took off, “not long after the last Ur-Quan dreadnought vanished from this region of space.” Fwiffo grew scared on the moon and relocated repeatedly to locations farther and farther from Earth until he ended up on Pluto. It was apparently he that set the bulldozers on the moon running around just to make it look like there was some kind of activity. He also imparted information about some allies. The Yehat joined the hierarchy as battle thralls, but the Syreen chose the shield. The Shofixti made their own sun go supernova, destroying dozens of Ur-Quan dreadnoughts, rather than submit. We enlist a self-identified coward. The Spathi at first claimed that he had a lot of crewmembers with him, but under interrogation admitted that he was alone. He joined his ship to my fleet when I suggested it. His ship apparently has a weak laser attack but a hard-hitting rear missile attack. I returned to starbase and bought some upgrades, including additional thrusters and turning jets, fuel, and another cargo storage pod. Then I went out to explore other systems. Adding modules to my ship at the starbase. 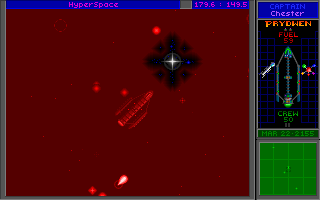 When you get beyond the confines of a solar system, the game automatically puts you in “hyperspace”–a sort of fog with dazzling lights and sparkles. Exits to solar systems appear as windows. There’s a cute animation when you go through a window and spin out of hyperspace. About to come out of hyperspace. The closest system to Earth, Sirius, had one feeble planet–rich in minerals but extremely volatile. 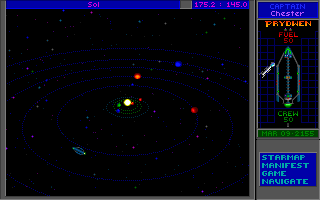 I moved on to Alpha Lyrae and Beta Lyrae, which between then had 7 planets and a few moons. Around this time I printed the game map (the clean one that Harland provided) and started annotating planets I’d already visited, including a mark to indicate if I left minerals behind because the planets were too rough–just in case I get an upgrade to my rover later. Alpha Centauri had 9 planets to visit, plus some kind of small ship going between them. I made contact with the ship (which you do by flying into it) and was greeted by Trade Master Greenish of the Melnorme starship. He seemed to know everything about us but refused to share anything of his race, including “our history, psychology and mental powers, our unique physiology, the exact locations of our homeworlds, or our potentially ominous long-range plans.” He went on that the entire basis of the Melnorme economy is trading information, and that he had some information right there in front of him, on his screen, that would be of tremendous value to us. Unfortunately, we had nothing he wanted. He was looking for the “coordinates of certain strange worlds whose radiant energies defy all scanners, producing a rainbow-like image” plus biological data. The Melnorme are a very free-market species. My hold was full after Alpha Centauri, so I stopped back at starbase and used my resource units for some more upgrades, including a “Dynamo” to upgrade our weapons. While at the base, Commander Hayes told us some radiation was being broadcast their way from the nearby Rigel system. My last expedition of this session took me to Wolf, Rigel, Saurus, and Canopus–all nearby systems. In one of the systems, I finally found a world with life signs. On the surface, I encountered all kinds of odd species, and I used my stunners to knock them out and collect data on them. It was tough to get a screenshot of the alien life forms. Here I am running into one. In the Rigel system, I encountered another spaceship and approached. I was contacted by a species–or, rather, three species from the same planet–called Zoq-Fot-Pik. The Zoq and the Fot (or maybe it was the Zoq and the Pik) did all of the talking, sometimes at odds with each other. The Pik just sat in the back and looked back and forth between them, which was kind of funny. The gist was that they came from a peaceful planet, but their colonies have all recently been destroyed in the crossfire between “huge green battleships” on one side and “ships as black as space” on the other. When we said that we’d try to help, they praised as the chosen ones promised by the Great Crystal One (the Chenjesu?) and gave us the coordinates to their home planet so we could meet with their leaders. I hope the “great crystal ones” didn’t promise much. Based on the plot threads so far, I’m piecing together a hypothesis. I think the Ur-Quan had just conquered Earth when some new threat, flying black ships (the same that attacked the Tobermoon in the introduction) appeared in their space. Thus, they abandoned Earth and have been waging war against this new threat. The lander window is criminally small. I can see why the remake would have “fixed” that. The appeal of the music is lost on me, I’m afraid. I don’t play games with the music on even when there are multiple compositions fine-tuned to the player’s actions at the time. I couldn’t enjoy a game for more than 30 seconds with a relentless rock composition playing endlessly in the background. There’s a “starmap” that lets you see how far it is to systems and how much fuel you’ll use getting there. I wish it also allowed you to jump directly. Slowly building up speed and cruising out of the various local map scales is the most annoying part of exploration. Alpha Centauri had a lot of planets. 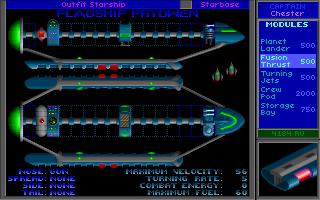 It’s impossible to play this game and not think of Starflight, and while Star Control II seems to get more superlatives, I think maybe Starflight was better. It was a little more of an RPG, for one thing, as your ship was staffed by a small number of named crewmembers who had different skills. 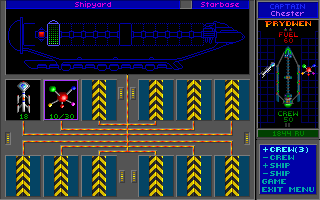 There were more ship stations to make use of those skills. 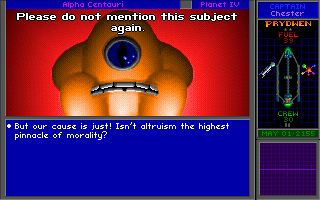 (Star Control II notably doesn’t have a medical bay; crewmembers are either perfectly healthy or dead.) 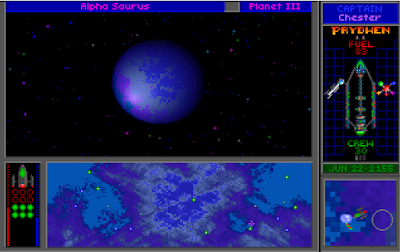 Mining planets was a little more of a challenge. 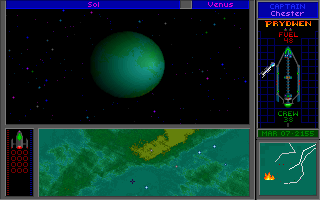 The planets were a lot bigger, so you needed more than just the planetary coordinates to find key items. I want to like the dialogue system in Star Control II, but the options so far have been unsatisfying. The “best” one is usually quite obvious. I think I liked Starflight‘s “stances” better. 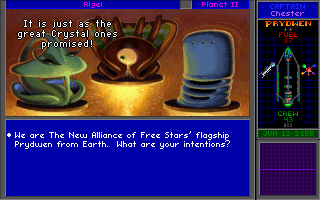 On the other hand, I think I’ll ultimately like Star Control II‘s combat better, and there’s otherwise plenty of time for it to change my mind. It’ll still rank high even if I don’t think it’s as good as Starflight. I’m having a lot of fun with the open world approach. The dialogue system always offers a few options that are somewhat stupid. The alien races are a little cartoonish. I wish the game had taken them a little more seriously. However, I recognize that broad characterizations are probably necessary for brevity’s sake, so I’ll give the game a pass unless it gets completely out of hand. For my next move, I can try to visit the Zoq-Fot-Pik, see what’s up at the worlds of our old allies, explore systematically outward, or roll the dice and pick a random location. I’m leaning towards the latter just because I can.